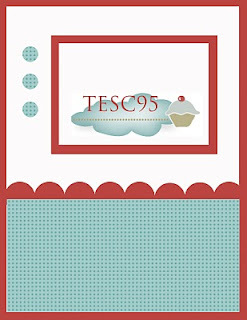 This week at Just Us Girls, the challenge was to use a template and the bonus challenge was "to make it something blue". 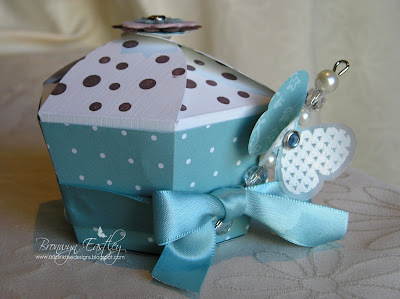 I checked out all the templates from their Guest Sponsor, Kelleigh Ratzlaff at Digichick Boutique, and decided on using the Cupcake Box. 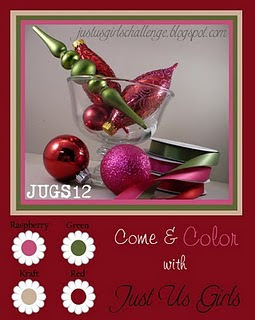 I did buy 2 other templates (couldn't resist) while I was browsing in the wee hours of the morning! You'll probably see those in later posts. As you can tell from the collection of photos, I was pretty chuffed with how it turned out! 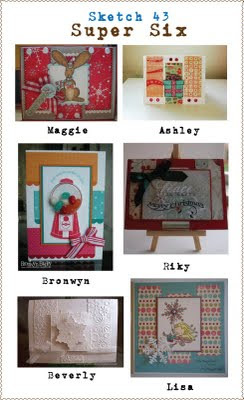 Apart from the template, all products are from Stampin' Up! Another Photo ... just because I could! Mmm... 2 challenges today and very little housework. I did read somewhere in my web browsing today that, "Housework only comes before stamping in the Dictionary" ... so true! Happy New Year to you all ... see you in 2010! Congratulations to Dave and Suzie who welcomed Mariella Zoe Jane Knox Klauber into the world! Phew, the name is nearly as long as it took me to create this card! When I need to make a card, it's great to look at the sketch challenges on-line. It really helps when you've got a layout to follow. 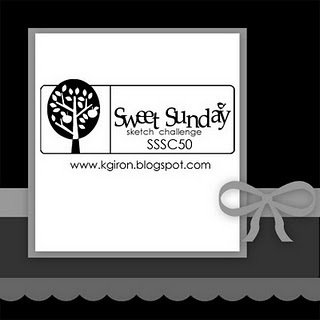 I thought Karen Giron's Sweet Sunday Sketch Challenge was just right for what I had in mind. 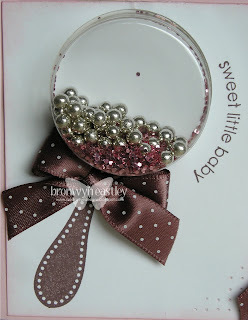 I was wanting to use a Sweet Treat Cup to make a baby rattle and I filled it with Silver Cachous from my pantry and SU Light Pink Chunky Sprinkles (on special in the Inventory Clearance Sale). Here's the card I did for the latest Stampin' Sister's in Christ Challenge. This week's inspiration was the sketch below, along with some great examples by the design team members. I decided to use my favorite verse on this card. I thought it was an appropriate one to use as we reflect on 2009 and think about the New Year ahead! The only SU products used on this card are the white grommet, build-a-brad and buttons from Button Latte. 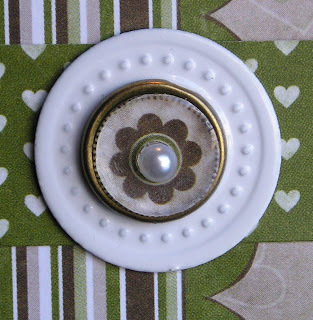 There's a great tutorial that Marelle Taylor (thINKspot) found showing you how to use the new grommets. 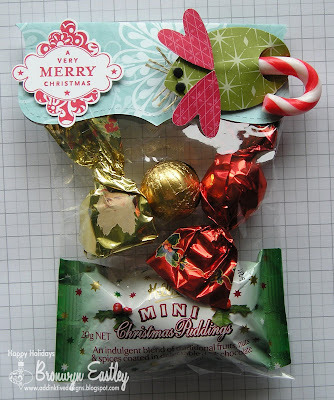 These are new in the Summer Mini catalogue and are so easy to use. 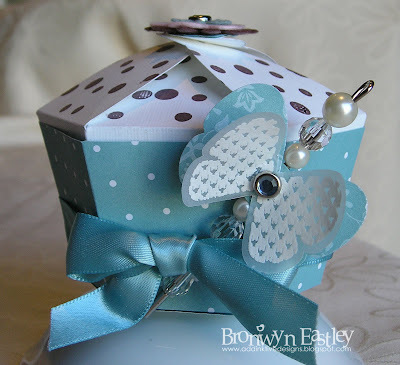 The tutorial can be found at Patty's Stamping Spot. Thanks for stopping by and have a safe and Happy New Year! PS: Thank you to the SSCC team for giving me an award for this entry. This is one of the challenges that I really wanted to make time for this week as I haven't entered a Sweet Sunday Sketch Challenge for a while. The idea for this one has been rattling around in my head for the last 2 days so I got up early this morning and finally put it all on paper! 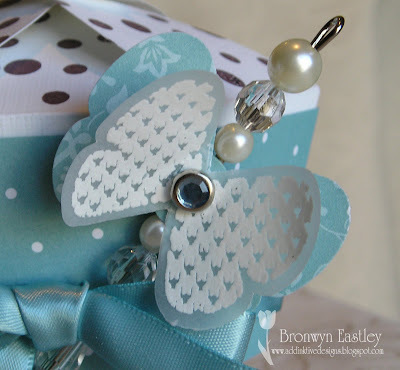 The DSP I used is from Stampin' Up and it's called, 'Bella Bleu'. It's one of my favourites. 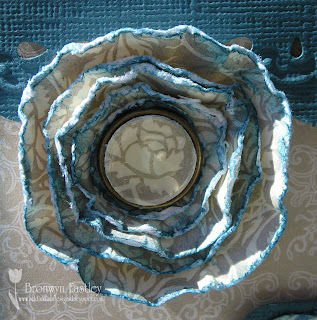 I chose it because I wanted to make a ruffled flower for the embellishment in the top left hand corner. 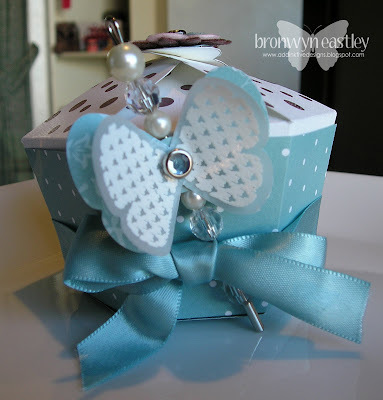 I got the idea of putting a Build-a-Brad in the centre from the latest Australian Cardmaking Stamping & Papercraft Magazine. The flowers have been punched out using all of the SU Circle Punches, scrunched, distressed and then sponged with Not Quite Navy Ink. 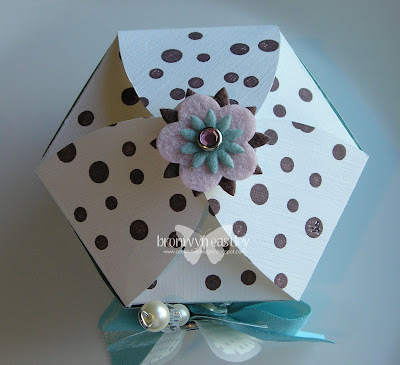 I have used Kraft cardstock and NQN textured cardstock to match the DSP. 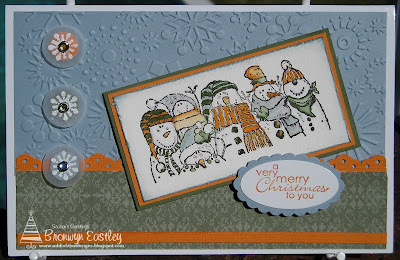 I love using Stampin' Dimensionals on practically all my cards and I have put an edge strip along the back of the lacy border, as well as behind all the other panels to give it more dimension. The 'for you' sentiment is from 'Fresh Cuts' (SU) and the bird stamp is one I had purchased from a craft shop ages ago and it got inked up for the first time today! I love how it turned out. It has a real 'Vintage' feel to it. The sketch was really fun to play around with. Thanks, Karen. I wanted something quick and easy to do for some last minute Christmas Cards. I saw something like this on Splitcoast but can't seem to track the original down. 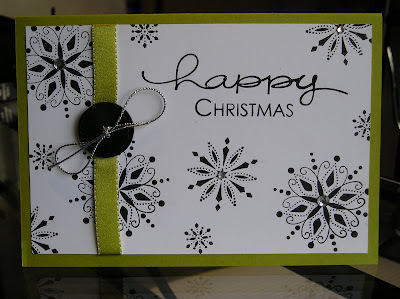 I know it had a scalloped border under the ribbon as well. I basically looked at some of the wider ribbon in my stash, decided to use the corresponding colours for the ink and for the circle under the Vellum Snowflake. 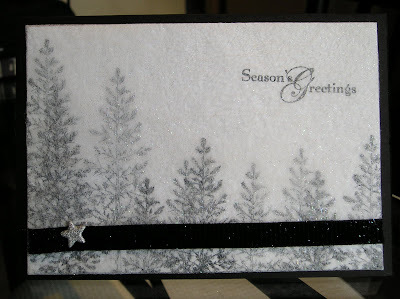 I have used the Snow Swirled Stamp set. Well, I hope that's the last of all the Chrissie cards for now. I didn't make a lot this year. Will have to be more organised and start much earlier next year. Thanks for stopping by. I'm always amazed at the Traffic Feed and love seeing that people from all over the globe drop by for a peek. I sometimes browse at their blogs and have discovered some truly inspiring work and have gained lots of ideas to make my humble little blog a source of inspiration to others. When I first started my blog, I wondered if anyone would actually read it, except for me and one or two others! 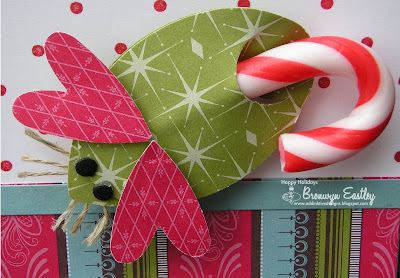 When I posted the Candy Cane Mouse on Splitcoast, the Traffic Feed went 'off'. I had 577 visitors in the first 24 hours! Wow! I love reading the comments that people leave. A big thank-you to all those out in 'Blog Land'. Have a truly wonderful and meaningful CHRISTmas. It's more than just a holiday! This is my first, Just Us Girls' Challenge. I have been following their site for a little while now and thought I'd give this one a go! I've set myself a goal to have a go at all the challenges I follow and display in my side bar this week! This one was a little tricky with the different combination of colors. My daughter said, when I showed her the card, "That's a bit random, mum". Sigh! ... so true as this one was just not my style. However, the whole idea of challenges is to CHALLENGE! 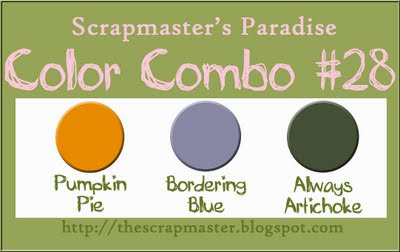 I still have Christmas Cards to make so I thought I'd try a Color Challenge from Scrapmaster's Paradise to keep me thinking 'outside the square'. This is the first challenge I have entered with them! The combination of colours looked fun and I was looking forward to inking up 'Holiday Lineup' for the first time and having a dabble with the aquapainter. 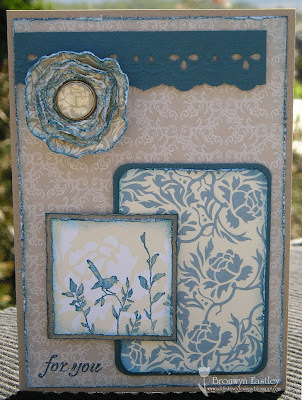 Bordering Blue was the first SU stampin' pad that I purchased. I love it! So anything with that color in it was bound to catch my attention. 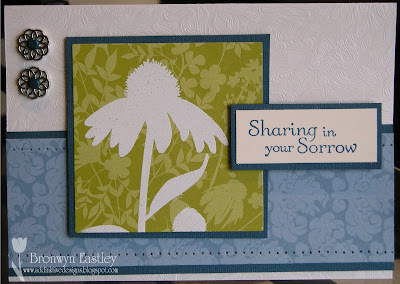 I also used a sketch from Taylored Expressions and made it a bit wider to suit the stamp. My friend and work colleague, Jeane, was so pleased to give me a card that she made using the Dryer Sheet Technique. I had never heard of it before! Clever, don't you think? It's a pity this photo doesn't show up all the sparkly Dazzling Diamonds in the dryer sheet. I was pretty impressed! This one is from Tania. 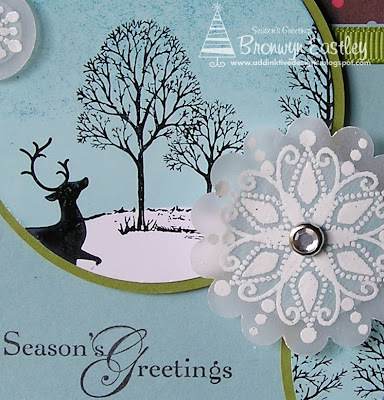 I just love the snowflakes and the gorgeous Kiwi Kiss Satin Ribbon. You can view the other that she made using Circle Circus here. I hope I get to finish my Christmas cards tomorrow so they can be posted on Monday! Panic! I have followed the Mojo Monday site for quite a while and love their sketches, but had not got around to entering into the fun until now! Here's a card I made for the staff at school to sign. It's for our surfie Chaplain, Dave and his lovely wife, Suzie, who are expecting their first child just after Christmas. 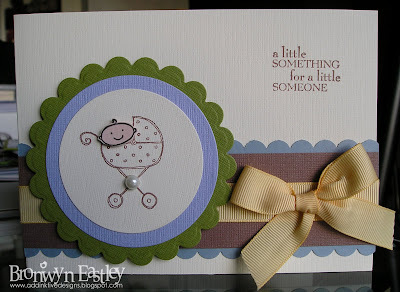 To begin with, I wanted to use my So Saffron ribbon from the Ribbon Bundle promotion that SU ran a couple of months back, as I thought it would look cute on a gender neutral baby card. I then looked at the Color Coach and went from there. 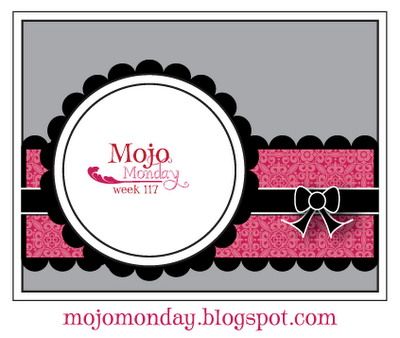 Mojo Monday helped me with the sketch and it was plain sailing from then on! Once the colour and layout has been worked out, it's much easier to find the stamp set/s that you want to use. I've heard a few people say to me lately that they can never seem to come up with ideas on how to make a card that they haven't CASED (copied and shared). I can recommend having a go at some of the challenges offered on-line as it really gets you thinking outside of the square and the Color Coach is also a great resource to own. I would never have thought of putting those colours together, but I'm pleased with how it turned out. My daughter said to me the other day, "If you're doing what you love at least one person is pleased". So true! 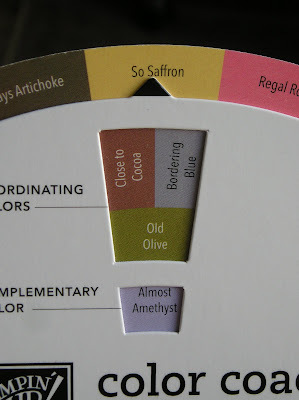 Cardstock: Very Vanilla, Old Olive, Almost Amethyst, Close to Cocoa (All textured), Blush Blossom and Bordering Blue. 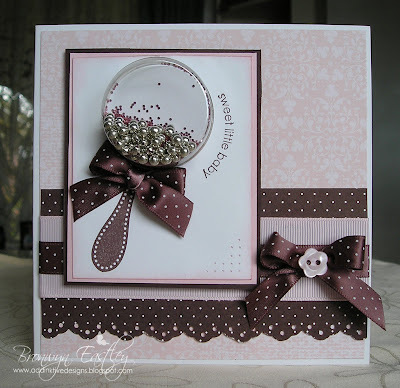 Accessories: Half back pearl from the Pretties Kit, So Saffron Ribbon, Stampin' Dimensionals, Scallop Edge Punch and Die cuts for the circles. 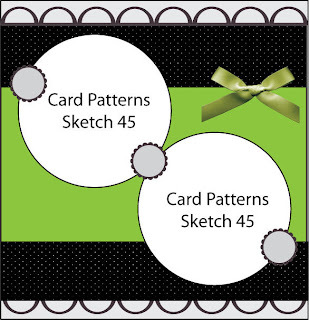 I was absolutely thrilled to be asked to be a Guest Designer for Card Patterns this week. Here's my take on Sketch 45. It involved masking, brayering, sponging, stamping and heat embossing, so I got to play around with a few different techniques, as well as a great sketch. So, you're probably wondering what an Aussie girl is doing making a Christmas card with a Winter theme. A girl can dream can't she? 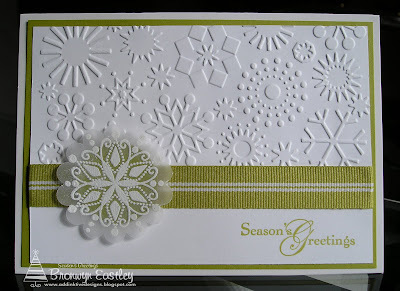 I just loved the idea of snowflakes being embossed onto vellum. 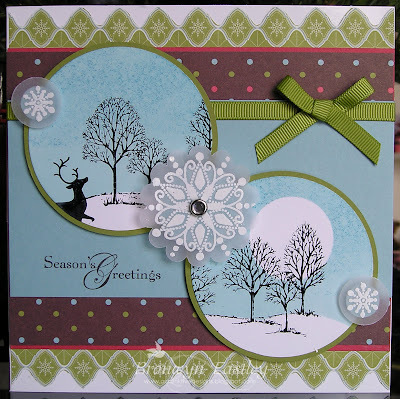 I was inspired by a fellow Tasmanian's Christmas Cards that she recently featured on her blog. 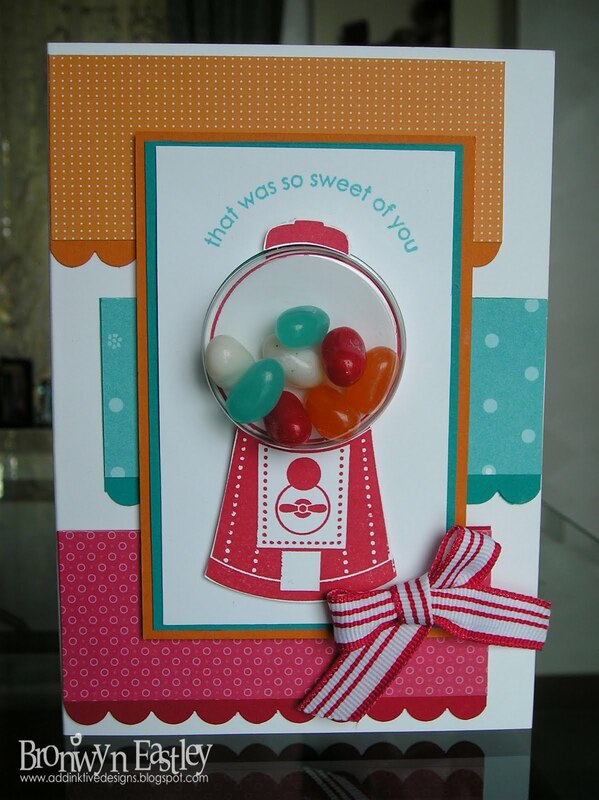 You can view her lovely cards at Mae's Cachet. All products are from Stampin' Up! 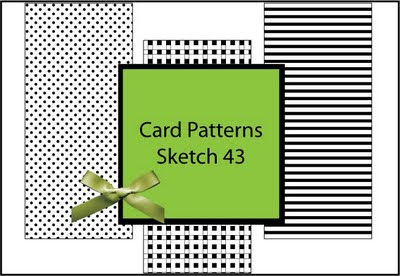 Here's a little peek at the card I designed for Card Patterns Sketch 45. It doesn't give too much away! I hope you can join in the fun, with the soon to be released sketch, in the lead up to Christmas. It would be great to see some fellow Aussies giving it a go. I threw myself into making this yesterday to take my mind off my Nan's sudden passing. It has been a 'mixed bag' this week with emotional highs and lows and it felt good to go out into my craft room and spend some time doing what I love! 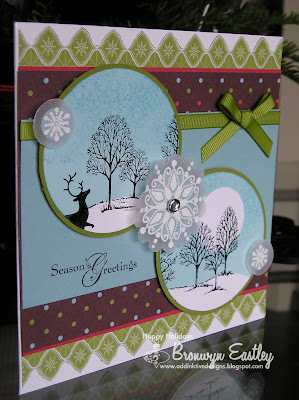 As you can see, even though it's Summer here, I still love Christmas cards with Wintry scenes! Although, one would be forgiven if you thought it might be possible, down here in Tassie, to have a White Christmas this year, unless the temperature decides to go in an upward direction very soon. Brrr ..
Wow! to find this out today was extra special! My lovely hubby spoiled me with a very cute silver bead for my Chamilia bracelet as well as a dozen red roses delivered to work! ... no not for winning this card challenge, but for our 25th Wedding Anniversary! Must be double points day today. 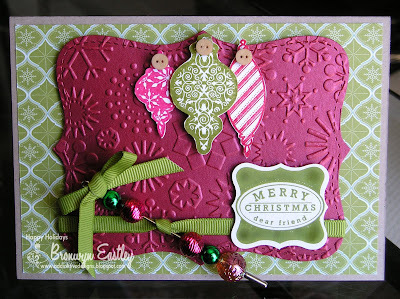 Hop on over to the Card Patterns Site to view all the other 71 awesome entries! 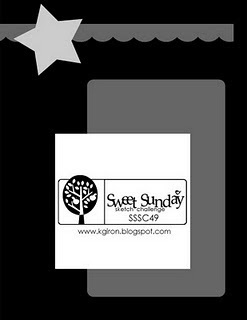 Have you had a chance to pop on over to my new Stampin' Up! Website? If not, why don't you take the time to have a browse. You'll see some great project ideas posted by the Company to get your creative juices flowing! Here's a couple of projects from the recently released Summer Mini. All the project requirements are listed with each one. Happy browsing! Great news! A few of the popular products from the Spring Mini Catalogue are still available for purchase even though the sales period for the mini is now over. These products will also be available in next year's Idea Book & Catalogue. How awesome is that? I'm especially pleased about the Scallop Oval Punch as I LOVE my SU punches!! 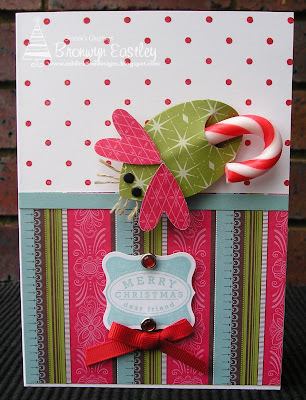 Here's a cute little mouse that I designed from the Ski Slope DSP and some Stampin' Up punches. 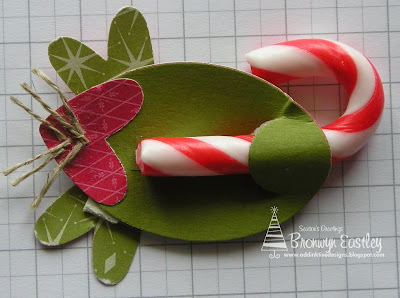 I have made something similar in felt as a Christmas decoration and thought I'd adapt it to use for paper crafting. Hope you have fun creating one of your own! 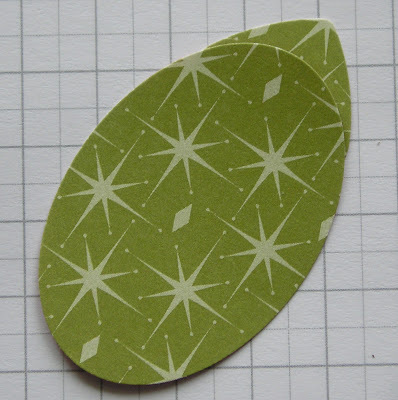 Punch out some Old Olive cardstock and matching Ski Slope DSP with the Wide Oval Punch. Punch out one medium sized heart in Old Olive DSP and two larger hearts in Real Red DSP using the Heart to Heart Punch. Glue the two wide ovals together for extra thickness and support for the mouse's body. Glue the medium Old Olive heart underneath the body and leave a bit showing for the mouse's nose. 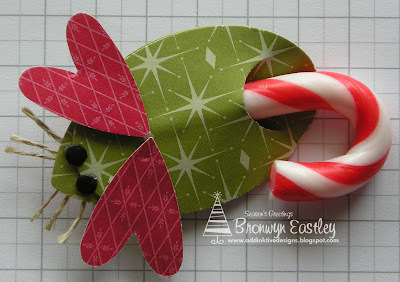 Use the slit punch at the end of the body for the candy cane to slide through. 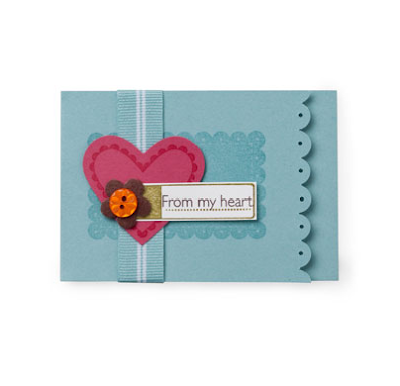 Attach the large red hearts, for ears, with Stampin' Dimensionals. 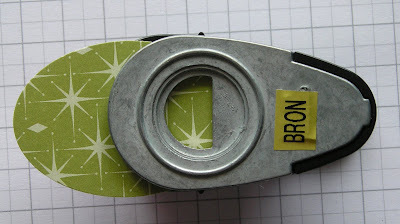 Use the Crop-a-Dile to punch out small eyes with Basic Black cardstock or use black brads instead. Use sticky strip to attach linen thread for whiskers. Put the candy cane through the slot. Secure with sticky strip. ... or use him as a decorative feature on a Christmas card. Inspired? As a courtesy when CASEing this design, please acknowledge the original source by linking back to this post.